She could feel Queen Elizabeth II's affection for China while presenting her credentials to the monarch a couple of months ago. It was evident in the queen's tone. "Her Royal Highness was very impressed on her tour of China in 1986. She recalled discovering that the expressions of each of the Terracotta Warriors was different," says Fu Ying, China's ambassador to the United Kingdom. The warriors in Xi'an were made to guard of the tomb of the first Chinese Emperor Qinshihuang. Fu presented something else with her credentials to the queen: copies of British Illustrations from the Imperial Archives. "The illustrations on 18th century Britain was that country's gift to China in 1793 and Her Royal Highness liked it," Fu says. 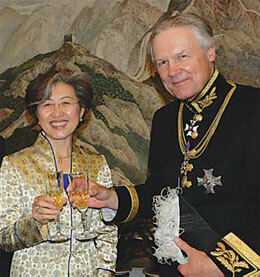 Fu Ying with Sir Anthony Figgis, HM Marshal of the Diplomatic Corps, at a banquet after she presented her diplomatic credentials to Queen Elizabeth II at Buckingham Palace on June 12. But the warmth and affection didn't make Fu forget the importance of her post and the challenges she faced, especially because a "China fever" has gripped the UK. "From the queen to the ordinary man, people from every walk of life want to know more about China and its culture," she says. That fever is expected to rise further with the opening of an exhibition, "The First Emperor: China's Terracotta Army," in the British Museum on September 13 when more than 200 artifacts and about 20 original terracotta warriors will go on display. The museum says the show will display "the largest number of terracotta warriors outside China". "People are falling over each other to book tickets on the Internet or get them through other channels. They are in a race to reserve the after-show evenings for China-related activities, too," Fu says. China and the UK have had frequent and high-level cultural exchanges. Spring Festival celebrations and parades in London have been a huge success in the last two years. Fu says more than 300,000 people participated in the Spring Festival celebrations in London's Trafalgar Square this year, and the number could reach 500,000 next year. Moreover, London and other UK cities are planning to celebrate all things Chinese again next year. The event will begin with the Chinese Lunar new year and continue till the opening of the 2008 Beijing Olympic Games. To be called "China Now", the gala will have 700 programs on culture, arts, trade, science, sports and medicine to help Britons get a comprehensive and objective view of modern China. Beijing will send high-level leaders to take part in the opening ceremony of "China Now", which is tipped to be the largest, longest and highest-level China-UK cultural exchange. Back at home, the just-concluded British Museum's touring exhibition, "Britain Meets the World", in the Forbidden City was warmly welcomed by the Chinese people. Such events and exchanges are fine, but Fu knows she has to do something more. She realizes new channels for economic and business links have to be opened to develop "all-round strategic partnership" between the two countries. There will be more opportunities to strengthen bilateral ties and promote mutual exchange, says Fu, referring to some forthcoming events. Invitations to talk about Chinese history and culture, which she gets occasionally, are just one example. "The historic relationship among society, economy and culture in China is rare to find in the rest of the world, and many foreign business people are really interested in such topics." But her focus will be on Chinese enterprises' investment in the UK. Fu says the UK attracts about US$170 billion from leading financial and service industries across the world every year because of its favorable investment environment. Many Japanese and South Korean companies have expanded across the globe from the UK because it provided them with a perfect international platform. British firms can help and advise their Chinese counterparts as they look for state of the art technology and seek greener pastures abroad, she says. Environmentally friendly technology to cut energy consumption and reduce pollution, as well as to upgrade manufacturing capabilities, is something that Chinese firms can do with. It's true that trade between China and the UK is flourishing, but it still lags behind that with Australia, where Fu was the ambassador for four years before taking up her present post. The UK holds only 1.5 percent of the Chinese market. And though China-UK trade accounts for 11 percent of the total volume of China-EU trade, the figure is less than half of that between China and Germany. "Hence, there is great potential for us to work together with the UK." There are strong complementary links between the two countries, which are considering holding a high-level bilateral trade and investment forum during Prime Minister Gordon Brown's visit to China. "I believe the forum will play a positive role in facilitating information sharing, and take trade and economic cooperation between the two countries to a higher level."